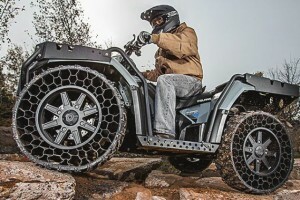 As reported by The Verge, Polaris’ airless tires have been out in the wild for several years available on their MV 850 military grade ATV. During a mission it’s generally just as critical to keep moving forward as it is to retain the ability to exit a bad situation. What advantage can special tires provide? Polaris states their airless tires can travel 1000+ miles after being hit by a round of the M4/AK47 variety, or 350+ miles if struck by a .50 cal. Pretty impressive. Regardless of the various scenarios and tests, or achievable speed after incident, this seems like a no-brainer upgrade for the future if only due to maintenance costs. A single ATV model with airless tires would be a fun addition to Arma 3’s light vehicle line-up, and just might prevent that all too often lonesome feeling because you busted a tire out in the field. Why do we still not have the ability to move while changing weapons? This was a touted feature in VBS2. In 2013. Yes, I understand the development teams/resources are different, and I agree the military version must remain a separate entity in the business of more advanced features. However, this should mean it’s only a matter of directing resources or aligning features. The code can’t be too far apart, and if they are, shouldn’t that be of serious concern as one could benefit the other to avoid doing double work? A three-point sling, or sling of any type (let’s not get caught up on visuals), would serve every role immediately. This is especially true for those primarily playing PvP in Arma 3, a game described as an infantry-focused combined arms sandbox. I think there’s a growing sense features fit for an Infantry DLC should have been in order before Zeus or Helicopters, and the topic of slings/switching weapons might be leading that charge. Still too hard to implement? Perhaps it’s hard to do without breaking other stuff? Let’s just speed up the animation like we weren’t afraid to do with — what could only be called a weird tactical trot — that made it to the production version for a brief period last year. The assumption of a trained soldier with a combat-ready mentality will suffice. Everyone shouldn’t need to have a mod to perform this aerial maneuver! Now that sling loading provides a beautiful and reliable way to handle supplies, and considering Arma 3’s improved interaction with UAVs, let’s marry the two. Enter the K-MAX Unmanned Helicopter. With future warfare leaning more in the direction of smaller, highly specialized teams of operators, delivering supplies to the field becomes more critical. A logistics UAV could offer a solution that keeps Arma 3 players having fun in the field together, with no one having to wait for someone to respawn and temporarily play pilot or the entire group RTB’ing after every objective like it’s the next phase of the game mode. In February 2012, Aviation Week wrote that the K-MAX unmanned helicopter had already hauled “over 100,000 lb. of cargo on more than 50 resupply missions in Afghanistan.” No doubt that number has grown exponentially since then, and by 2035 we can safely predict even more opportunities for unmanned vehicles working battlefield logistics. Ideally, this logistics UAV would be simple to manage, needing only pickup and drop off coordinates. Both the type and staging of supplies could be set in the mission editor or through scripting. Most importantly this service would remain void of the need to command any AI. Lastly, it would continue the trend of creating a flexible, optimized foundation of functionality for the community to take to the next level.